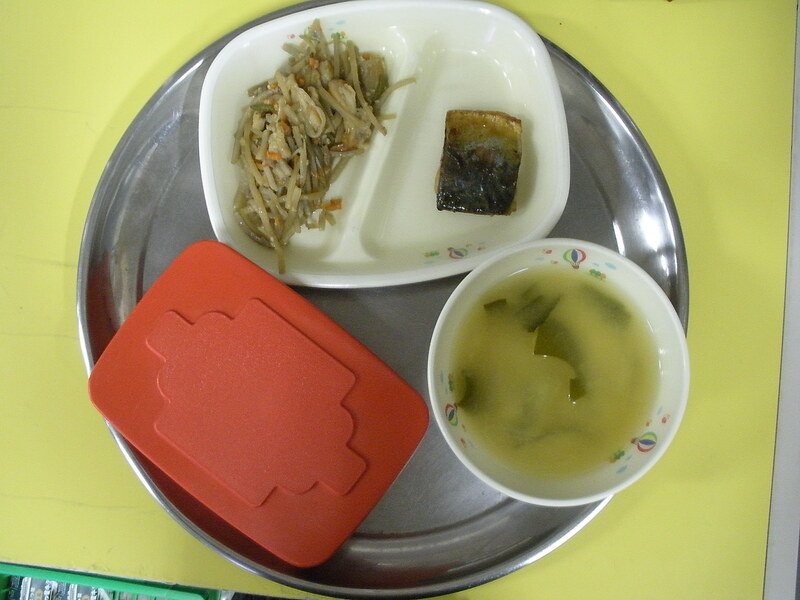 The salt culture broiled mackerel was introduced in August. 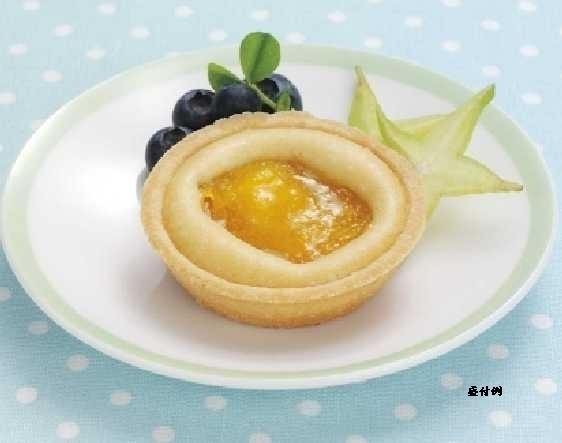 It is favoured for delicious moist taste. It is a dish we hope even those who don’t like fish will eat. 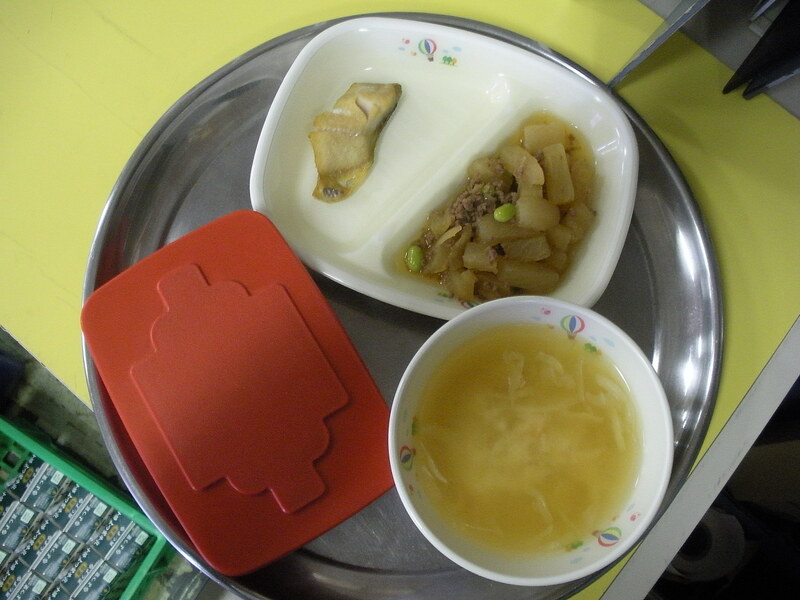 Kenchin soup is of course delicious, and as the school lunch menu above states, the Okhostk Atka mackerel had a mild taste and divided easily, making it easy to eat with chopsticks. In the past, I have felt the sweet potatoes and konbu are a little too strongly flavoured like konbu, but I didn’t feel that way today at all. It was quite good. Gomoku (five-ingredient) means to have five items or to mix in a variety of thing. In cooking, there is also the case of when you combine fish, meat, or vegetables. When I was a child, I had this awesome cookbook called “Five Ingredients or Less”. It was awesome because it was more likely we already had all the ingredients in the house and the recipes were pretty simple. My favourite recipe in that book was “Egg Drop Soup”, which is basically similar to the egg soup we eat here in Japan. That said, there is a saying in Japan that you should eat at least 20 (25? I forget) different ingredients a day. This makes sense, because if you eat lots of different ingredients then you will get lots of different nutrients. 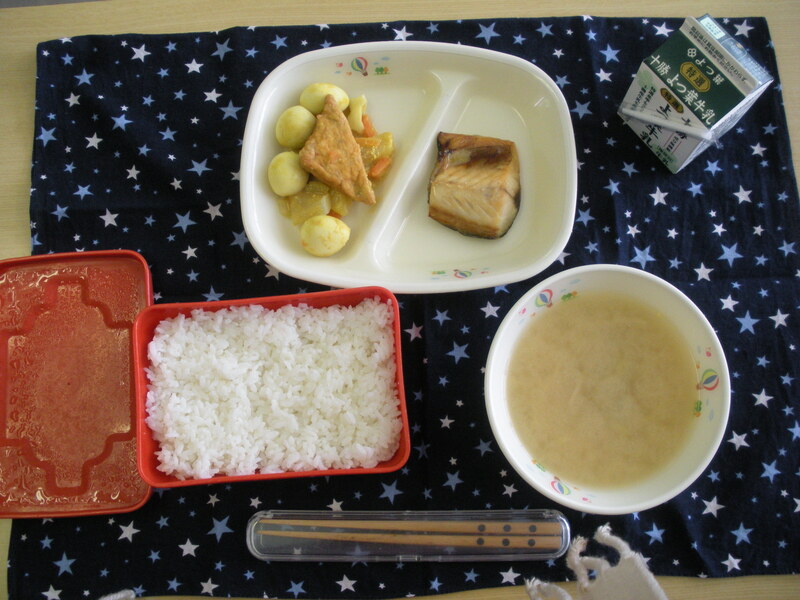 Japanese meals naturally lend themselves to this as well by serving lots of different dishes in small quantities. Judging from my friends, the most basic meal seems to have at least two different side dishes plus soup and rice. And I’ve seen a friend of mine throw together a 7 dish meal for an unexpected visitor based on things she had in her kitchen at the time. As for myself, one of my main eating flaws in trying to live on white rice alone. Seriously, I’ve had literal nightmares about getting beriberi. 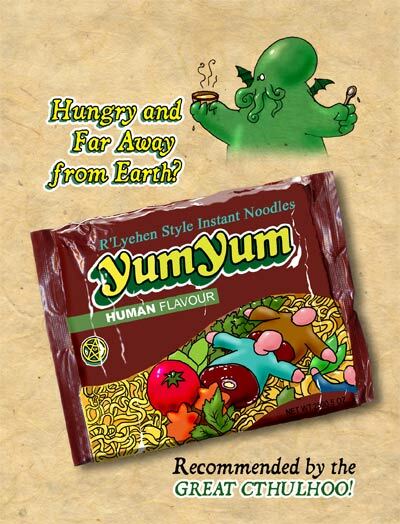 Yum!Yum! But slowly, I am trying to be more diverse. Daikon is eaten when you have a cough or a sore throat. At the end of the Meiji period, three times as many daikon were eaten than eaten today. We should eat more daikon! I didn’t eat school lunch today. 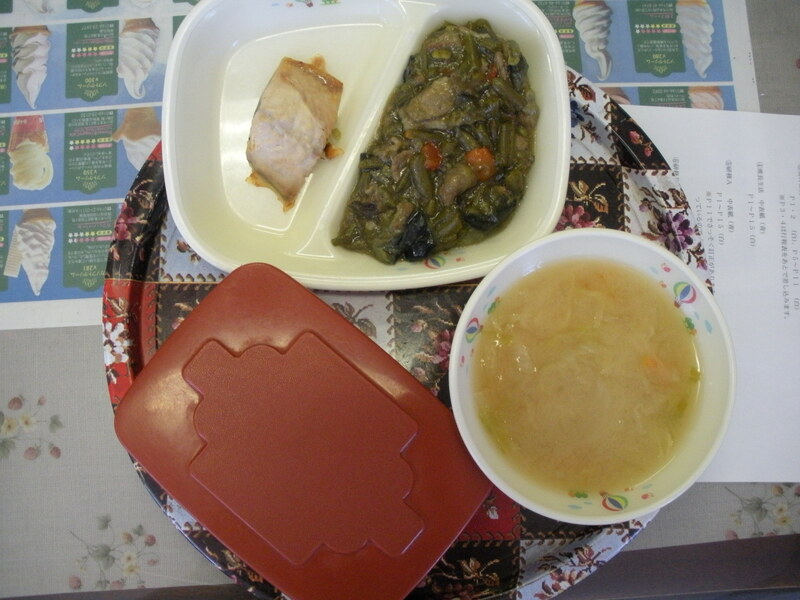 Ishikari soup is a symbol of Hokkaido. Salmon is a fish with lots of nutrients, especially it includes lots of Vitamin D, which helps us process calcium. Back in the day, there were no supermarkets. People had to go to a different shop for each different item they needed, or the merchants themselves would come and deliver their goods to each individual house. So I have read. But in the latter days of the 20th century, giant warehouse like supermarkets became to norm. However, Japan still keeps some of the old-fashion ways (for what was wrong with them?) Thus it is still common for vendors of certain goods to come to not their houses but their workplaces to sell their wares. I was reminded of this when the hanaya, or flower vendor, came to school, selling potted flowers to adorn the classroom or take home. Other vendors I have seen lately include the bread vendor, the yakult vendor (both who come once a week), soba vendor, and a vendor selling USB powered fans. 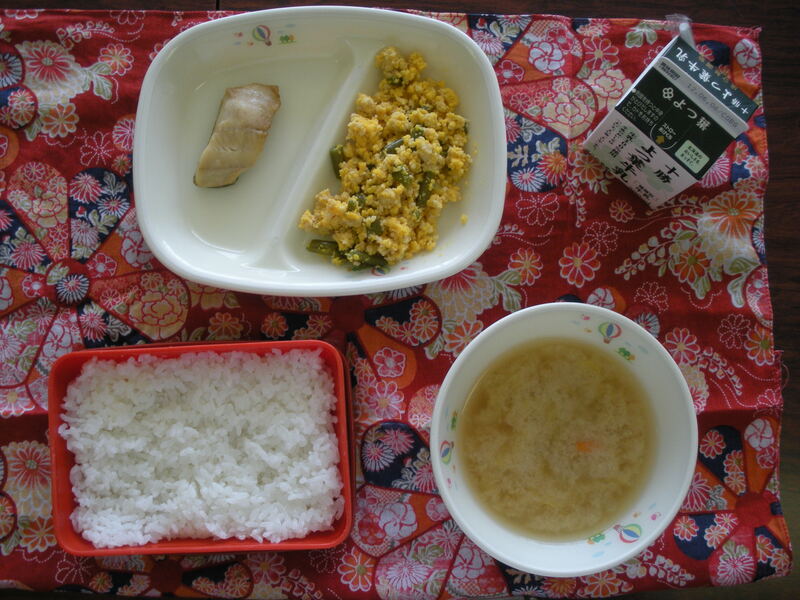 Notes: The ingredients of Mother-and-Child Rice Bowl like chicken and egg has plenty of protein. Especially, the complete nutrition of eggs, includes plenty of nutrients which give your body energy.